Dr. Nancy López received an appointment in the Department of Sociology at The University of New Mexico in 2001. 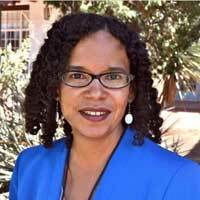 She is the director and co-founder for the UNM Institute for the Study of “Race” and Social Justice, an initiative of the RWJF Center for Health Policy to address the pressing social and economic issues that affect the health and well-being of all Americans. As part of its work, it offers undergraduate and graduate students the opportunity to earn a certificate in Race and Social Justice. López is also the founding coordinator for the NM Statewide Race, Gender, Class Data Policy Consortium. Her scholarship, teaching, and service are guided by the insights of intersectionality – the importance of examining race, gender, class, ethnicity together – for interrogating inequalities across a variety of social outcomes, including education, health, employment, housing, and developing contextualized solutions that advance social justice. Offering courses for both undergraduate and graduate students, her classes have focused on historical and comparative analysis of race and ethnic relations, the paradigms-theoretical frameworks that contribute to the social construction of race and ethnicity, intergroup relations, among other topics.